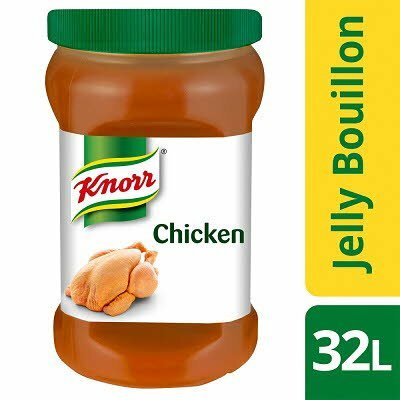 KNORR Jelly Bouillon creates perfect bases and is voted as best stock by the Chefs Choice awards. It is a chicken flavoured bouillon that is lactose free and gluten free. Use our bouillon to refine and season your dishes. As close to scratch as you can get. Our bouillon also comes in other flavours such as vegetable, beef, cheese, fish, lamb or mushroom. Concentrated chicken bouillon (61%) (water, chicken extract), salt, yeast extract, chicken fat (4.9%), flavourings, vegetable juice concentrates (leek, onions), gelling agents (xanthan gum, locust bean gum).